Tropical Writers are very proud to support' Savannah – Writers Voices in the North' inaugural Festival in Townsville by bringing Peter FitzSimons to tour both regional centres. Savannah and the Cairns Tropical Writers Festival will run on alternate years. 'It is all about strengthening the profile of writing in the Far North' says a Tropical Writers spokesperson. 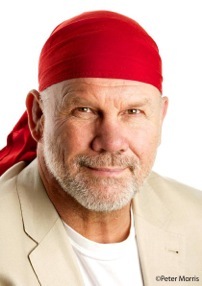 Peter FitzSimons is a journalist, radio and television presenter, author of several highly acclaimed historical and biographical publications; the most recent is ‘Gallipoli’. He is also a national representative rugby union player. The Tropical Writers Literary Lunch on May 21 is about the history of our nation through the eyes, and the pen, of a man who sees the humanity in the stories that mark our past, and guide our future. The youngest of seven siblings, family still comes first for Peter FitzSimons. As a student he was offered an American Field Service Scholarship in Ohio for year. He came back to study at Sydney University and Major in government and political science. His love of sport set him off on a successful career in Rugby while being published as a sports columnist in the leading national newspapers and one of the most popular sporting personalities on radio. He also has the reputation of being the only Wallaby (up to 2010) to have been sent off the field in a match against the All Blacks! Eventually he left the rugby field behind and pursued his other love - writing. Now regarded as one of Australia’s most popular historians Peter has published with Harper Collins and Random House to deliver the epic stories of Tobruk, Kokoda, Mawson and Batavia to name a few – his latest being Gallipoli. Understanding the importance of being a team, and the significance of mate-ship, Peter FitzSimons brings his characters to life and writes our history with a warmth and humanity that brings it home. There is another story that underlies Peter’s visit to Cairns, and that is the unique opportunity for Tropical Writers Inc, who produce the Cairns Tropical Writers Festival biennially, to support Townsville’s Savannah – Voices in the North Festival that follows the Tropical Writers Literary Lunch with Peter Fitzsimons. These two literary Festivals will now run biennially and support each other to provide networking platforms and opportunities to enhance the profile of regional writing and writers from North Queensland. Don’t miss this opportunity to meet one of Australia’s most popular historians and enigmatic speakers – and support the partnership between the two major literary Festivals in our North Queensland region.